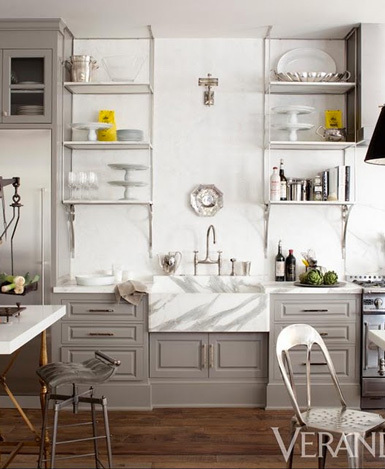 I've been noticing more and more lately the trend of open shelving in the kitchen. 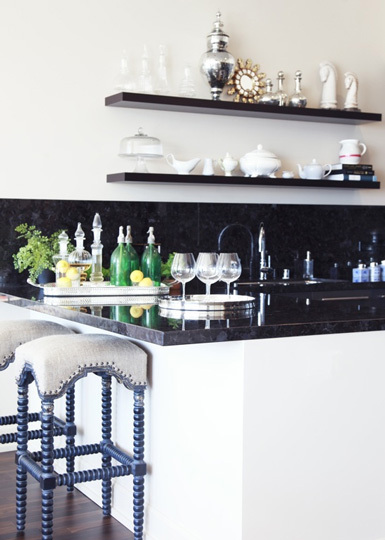 While I love the way it looks to have stacked dishes and glasses neatly displayed, I'm not sure it it's something I could commit to (it would bring out my OCD tendencies for sure!). I do enjoy having everything neatly tucked away behind closed doors, but, I also have lots of fun vintage dishes and vessels that I would love to have on display. I guess I could compromise with cabinets and a few open shelves, right? How do you feel about this look? 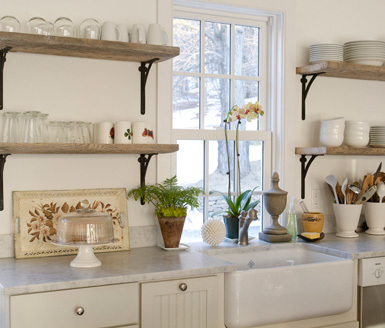 Do you have open shelving in your kitchen or is it something you would try? I'd love to hear your thoughts! I love the look of open shelving- as long as there's a co-ordinated and cohesive scheme going on with whatevers put ON them. I couldnt deal with a multitude of styles and colors of dishes and do-dads. Like you- I'm just WAYYYY too OCD for that. I vote for cabinets + open shelves. You can put your most beautiful things (only a few) on the shelves and keep all the rest behind closed doors. I have open shelves. I love them! But it does require keeping it all in order! Im definitely into it! Id love to have it in my house. Go open shelving! I love the look of shelves for maybe a lake retreat but cabinets all the way... reduces the look of clutter in my opinion. 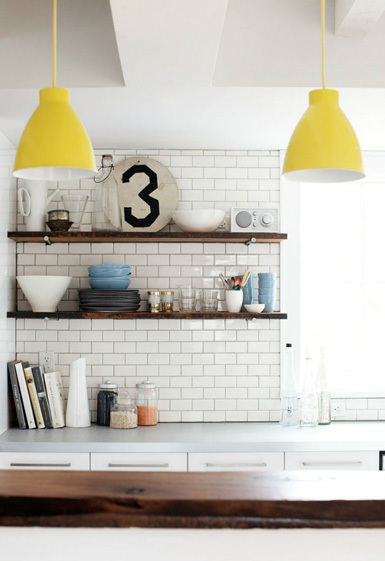 I'm all for open shelving - dream of having it in my kitchen one day! 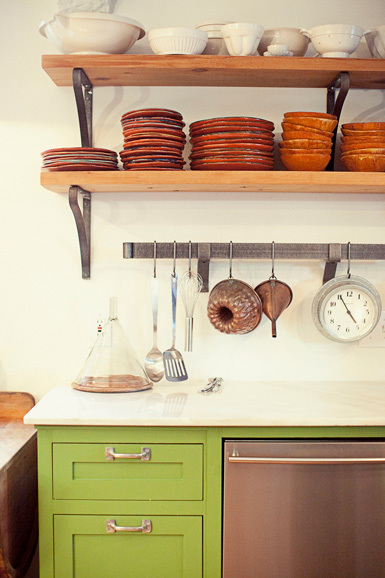 I love the look of open shelving as long as one has beautiful dishes to display and keeps everything organized! 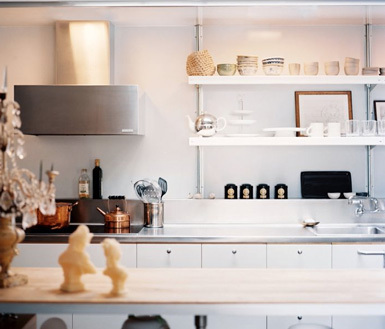 I am planning to renovate my kitchen - and there will be open shelving, something I could never have considered before! I guess all the beautiful pictures (styles like the ones you posted) with shelves have affected me. It looks so cozy and pretty! But I will also go for cabinets, and only a couple of open shelves. I want it to be neat and tidy, and could not handle to keep a whole kitchen with shelving organized. I think they are beautiful, as long as your decor is presentable. My daughter just moved into her own apartment, and it would make such a difference if she could take those ugly doors down and do open shelving. You have a terrific blog - love it! Thanks for sharing. I love this look. Such an amazing way to put your kitchen on display. I just renovated a house this year. I did half/half with reclaimed wooden shelves and all white cabinets. I LOVE them. They add a lot of warmth and character to the kitchen. I have open shelves at our lake house, I wanted a more open feel to the space and it definitely makes me think twice before I clutter them up.. just simple plates and a couple of owl accessories is all. Really like them! It really does look great in the above kitchens, and it would force you to be super tidy at all times. I guess that's a good thing?! It looks great, but is it really sanitary? You have to think about dust, cooking smells, ect. If you use open shelves to store the items you use in daily life, you won't have a problem with cleanliness. Every few days, before you unload the dishwasher, give the mostly empty shelves a once-over with a cleaning cloth and you're good to go. Define a base arrangement of dishes that will always stay on your shelves, then trade in and out some specialty pieces to capture the passing seasons or your latest whims. With a little bit of thought and care, your kitchen can become a giant art installation of flexibility, utility and personal charm . How does it get any better than that?? I suppose this is the modern version of your grandmother's china cabinet! I love the idea of displaying a few gorgeous pieces and keeping the rest tucked out of sight! I visited your Kitchens board on pinterest but didn't find that photo listed. it's my favorite one of them all!